Many thanks to Paul Bailey for sharing these photographs. 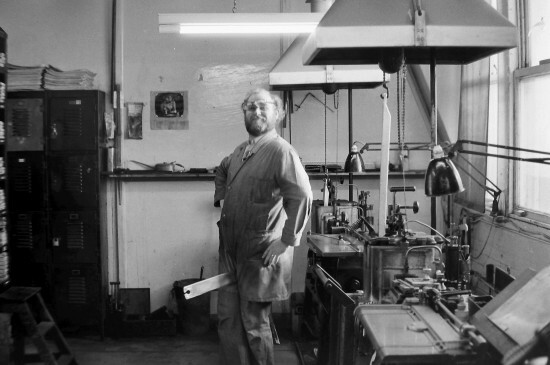 Says Paul: “Hi, found your site a while ago, I started work at Withy Grove Press, Thomson House, Manchester as an apprentice Monotype Caster & Keyboard Operator in the jobbing section, then I moved (upstairs) to the day composing and linotype section, then finally onto nights as a keyboard op on the national dailies. I knew I had taken some photos, but I had handed them all out to the lads as mementos when Withy Grove closed down. But having recently purchased a neg scanner to digitise family photos, I found the negs of the ones I had taken at Withy Grove. When Thomson House closed I went into chemical sales for a while, then went back into printing in Skipton at the Craven Herald as an Apple Mac op, worked in Keighley, Ilkley and Bradford before finally ending up in Blackburn at Newsquest North West Headquarters as a graphic designer. Five years ago the design production was farmed off to India. Since then I’ve had the odd job or two, but if some one offered me a job back at Withy Grove I’d snap their hand off. Great place, great blokes … loved it. Paul Bailey setting the Telegraph TV guide. 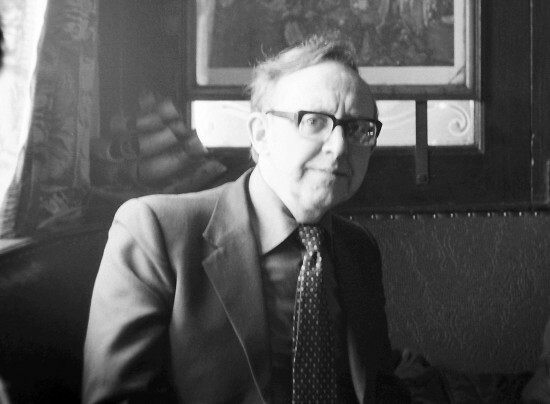 Paul Bailey seated and George Vale. Sam Calvert at the Elrods. Ged, messenger boy and Dave Grant. 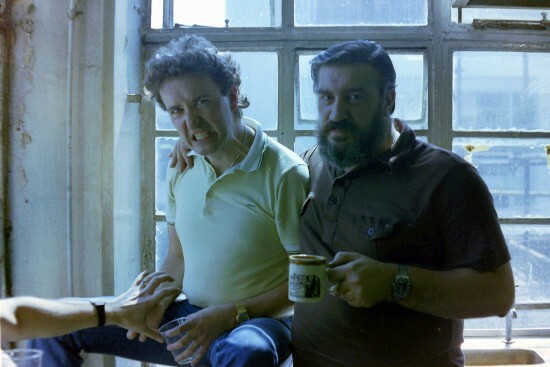 Denis Sidebottom and Bomber Harris. 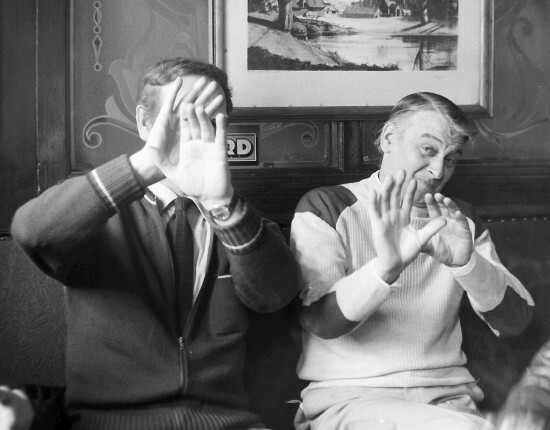 Brian Mottershead and Arthur Bond. Wow, a proper blast from the past! I was only a ragarse at the time, but still keep up with Dave Heald now and again, he will love these. Great pictures Plunger! Glad you enjoyed them Steve. I love the workplace pics. Dave Heald seen them yet? I have just text him the website, he will be in his element, especially the one where he is holding a tray of whiskey glasses in one hand and an empty bottle in the other . . . priceless! Lucky we had more full bottles of whiskey in the Chapel Office. What was the celebration Dave? Or was it “normal business.” Have you got any pics that could be used on the site? 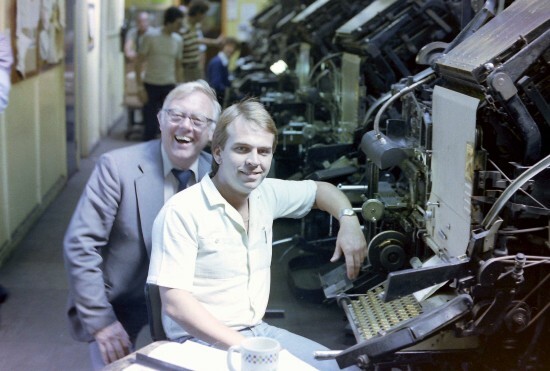 Wonderful times I was an apprentice machine manager at a Kent paper (Gravesend Reporter). 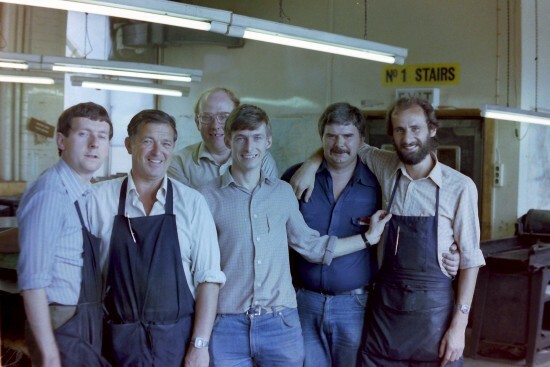 The pics just reminded how the print industry was, full of unforgettable characters, lots of tradition and the unions were so very strong because of genuine support for your fellow colleagues. Hi Susan, Glad you enjoyed the pics. M.o.C – a thankless task, but plenty of time off work for meetings (that’s my experience as an ex- F.o.C.). Lets hope Les Byers spots the article and makes contact. Les did mention something about a re union is there still one going? Not sure Susan, perhaps Les could reply here with details if there is one coming up. I was a Lino op from 1968 to 1979. My name is John Keefe (also known as Monkey!). Just wondering if anyone out there was employed at Thomson House at the same time as me? I left to go to the Daily Express and Daily Star. 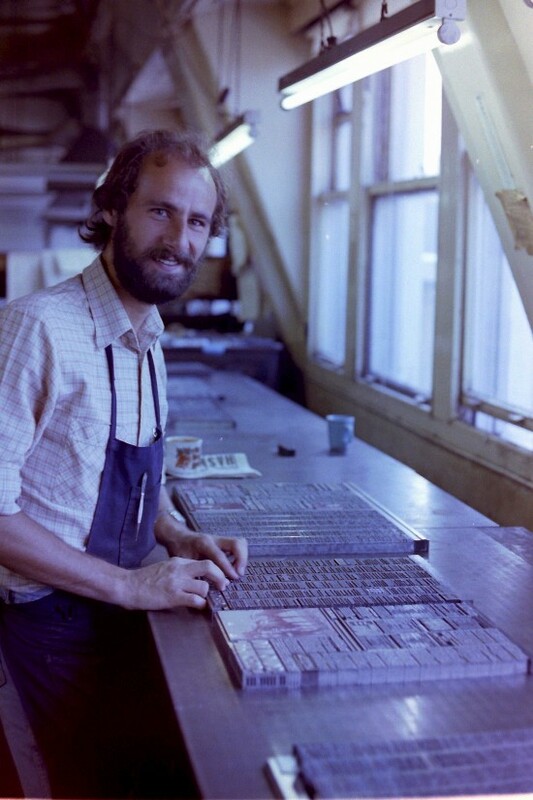 My Dad, Dave Wilson, worked at Thomson House on the linotype in the late 70’s and early 80’s. Sounded like it was a great place to work and i know he missed it when he left to go the Telegraph in Trafford Park. Thanks for posting the photos. Takes me back to when I was a kid and he showed me around. Hi. 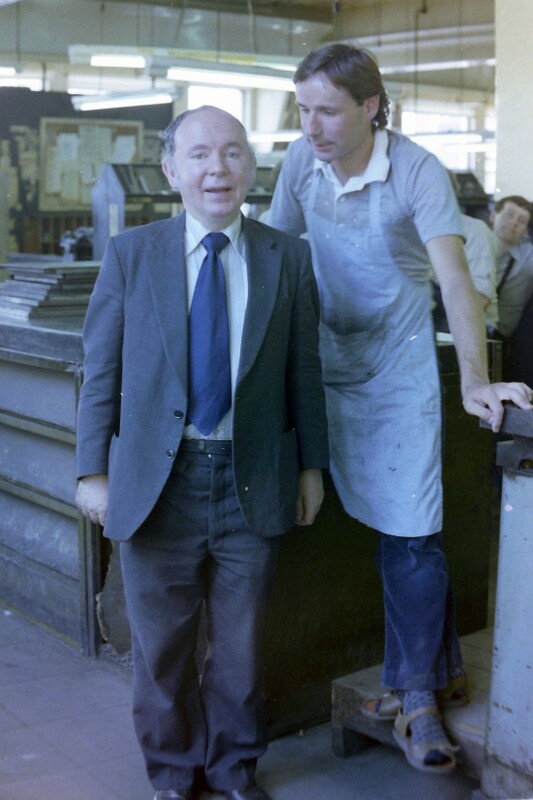 I was an apprentice compositor at Withy Grove Press along with Paul Bailey who was slightly younger than me. Great photos Paul invokogreat memories. 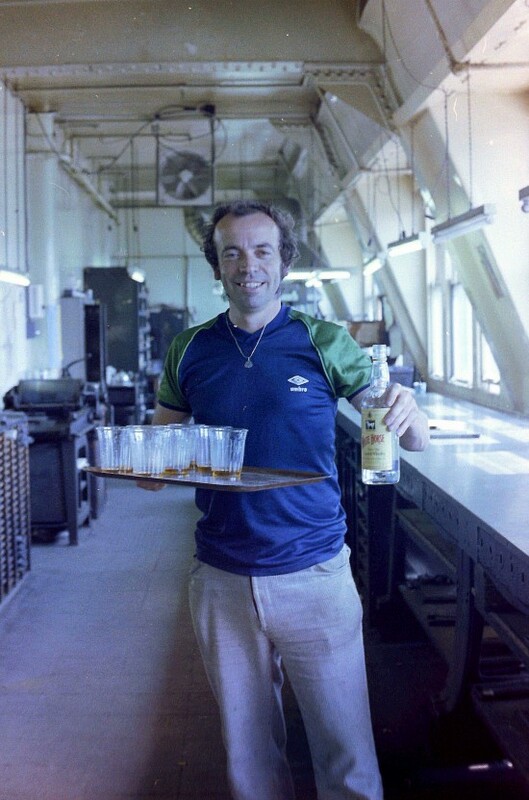 Started my 5-Year apprenticeship in August 1970. I used to do 2 hours overtime most nights except Friday and all day Saturday and some Sunday mornings. Loved working there. 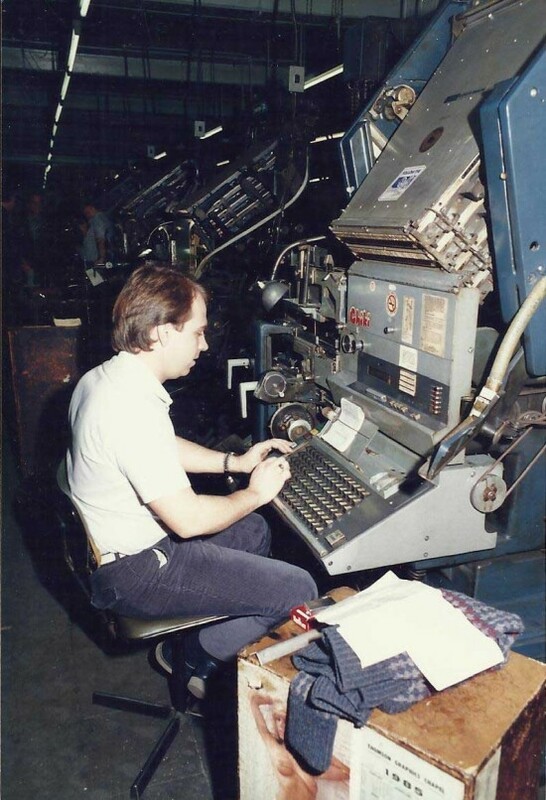 Worked last couple of years on Monotype keyboard. Then moved upstairs on the newspapers working on a Linotype machine. Moved to Manchester Evening News until redundancy. Started own print business with partner in Deeside. 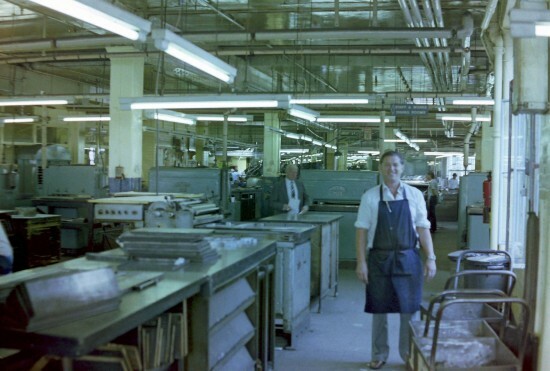 Then bought out by typesetting company in Newton-le-Willows where I relocated and became Production Manager. After 7-8 years again redundant and started digital print business with one of my sons. Now retired but remember fondly the heady days at Withy Grove.